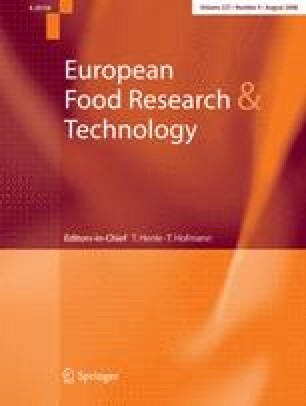 In dark chocolate, rheological properties during processing are influenced by particle size distribution (PSD), fat and lecithin contents with consequential effects on finished texture and melting characteristics. Multivariate regression, correlation and principal component analyses (PCA) were used to explore their interrelationships. A 4 × 3 × 2 factorial experiment was conducted with varying PSD [D 90 (90% finer than this size) of 18, 25, 35 and 50 μm], fat (25, 30 and 35%) and lecithin (0.3 and 0.5%). Rheological properties (yield stress and apparent viscosity), textural properties (firmness, index of viscosity and hardness) and melting index (duration) were respectively measured using shear rate-controlled rheometer, TA.HD Plus texture analyzer and differential scanning calorimetry. The PSD, fat and lecithin contents significantly influenced all rheological, textural properties and some melting characteristics. Increasing particles sizes reduced yield stress, apparent viscosity, firmness, index of viscosity, hardness and melting index of products with greatest influence with 25% fat and 0.3% lecithin, reduced with increasing fat and lecithin contents. There were high correlation (r = 0.78–0.99) and regression coefficients (R 2 = 0.59–0.99) among the rheological, textural and melting index indicating their high inter-relationships. In PCA, the rheological, textural and melting index accounted for >95% variance in the data. This study was co-funded by the Government of Ghana and Nestlé Product Technology Centre (York, UK). The sponsors are gratefully acknowledged for the Research Support. The authors thank Steve Beckett, Angela Ryan and Angel Manez (Nestlé PTC, York) for expert technical assistance.